Comic book movies have had to change a lot over the last twenty years or so. At one points they were all no brainer kids / fan boy movies but when Christopher Nolan took Batman to a new darker realistic place it changed the whole landscape of comic book movies. That’s one reason you can’t compare this reboot to the previous Fantastic Four movies as they have all been made with a different audience in mind. This one is a much darker and well thought out story which almost ascends a lot of comic cliches you might expect from a Fantastic Four movie. From pre release reviews the movie has had a bit of a bad reaction from critics even some Marvel artists who have worked on the comics said it didn’t live up to the FFs full potential. It might not be the masterpiece Fantastic Four movie which puts the Dark Knight trilogy to shame but it is a good movie and you have to give it a watch before writing this movie off and waiting until it hits Netflix. The movie starts off really thought out following the early days of Reed Richards and Ben Grimm. They went to school together and Reed is a child genius who has a theory about a teleportation machine. With a back story like that it would be hard to make it believable but Josh Trank did it. It’s an amazing start to the movie which sets up the world the FF live in. One thing I loved about this movie is the new origin using Planet zero which is more well known in the comics as the Negative Zone. It’s mysterious planet which gives the team their powers and has a lot of mystery around it. The old movie used cosmic space dust which just wouldn’t be too believable and by using the multi dimension angle it opens the movies up to loads of possibilities from the comics. I’d love for them to use it in the sequel and tap into the Marvel Zombies universe or just use the Negative Zone / Planet Zero as a way to trap Galacticus. From the trailers I was very curious about how the cast would work but with the new darker angle and they trying to make it more realistic they really pull the story together. The Sue being adopted by Johnny Storms family isn’t shouted throughout the movie it’s mentioned but it’s a small details and doesn’t matter too much so they don’t give it too much time thankfully. Having Ben Grimm and Reed Richards being friends from school worked well and then having Victor Von Doom in the mix brings them all together. The rivalry between Doom and Reed Richards is great to watch as it goes way beyond them just fighting over Sue. For most of the movie it’s more of a brotherly rivalry as they work together on the machine to let them travel between worlds. I really admired that Von Doom isn’t a typical bad guy and it is all about different points of view, yeah he wants to destroy Earth but he has his reasons. For me the main bad guy in the movie was the mysterious government guy who wanted to use FF and Planet Zero to make military weapons. The movie was overall very good but there are a few things which brought it down. The movie starts off great for the first 2/3 or so while it sets up the team but the end comes and goes way too suddenly. Compared to other comic book movies the FF has a big challenge as it needs to introduce four-five super powered characters along with covering their reactions to gaining these very different super powers. Most comic book movies struggle to cover it all in a movie for one super hero, this movie does an ok job of doing it for four heroes plus Doom. The movie is about an hour and a half long but it really needed an extra hour. The first act with them getting their powers is very well paced but could have had more time and the whole battle bit at the end was over too soon. Most other comic book movies have other around them to lean on for supporting characters, a long term goal or just more time to explain things. 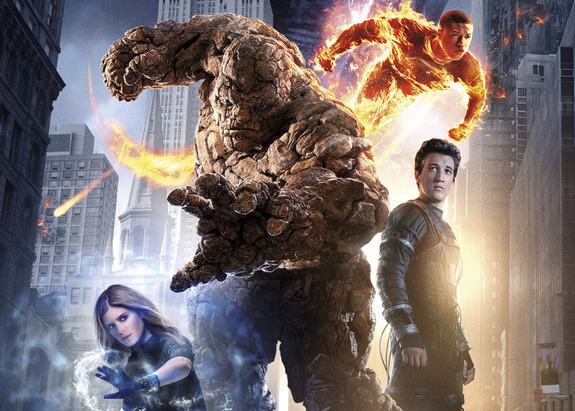 With Fantastic Four being all self contained there is a lot more pressure on them to cover it all in one movie. I think if all the Marvel Studios movies were stand alone some of them would have struggled to be as successful especially ones like Ant-man and Iron-man 2 or 3. If I was working for 20th Century Fox I’d have made this movie a bit differently not held back so much. They don’t have access to all those characters Marvel Studios does or the massive budget Disney puts up but they do have some good resources. They could have used any of the mutants if not all the main X-men to help work it into a bigger picture. Deadpool is one of the most talked about comic book movies at the moment. They could have worked a cameo or post credits scene in but just chose not to for some reason. Overall a lot of work has gone into this reboot and they have assembled a great cast, setup a great story but for some reason the movie seemed to be cut short and they missed out on a lot of tricks to make the 20th Century Fox movies all come together some how. One thing I do hope will save this movie franchise and help it get a sequel is a directors cut. Josh Trank has already said he had a much better cut of the movie. If that is true I’d love to see his cut. Maybe we will see it in twenty years like the Richard Donner cut of Superman 2. Still even with it’s problems it is a great movie and I’d well recommend seeing it.